The adventures of a high school for superheroes while the Marvel Family fights evil with the power given to them by the wizard, Shazam. the cartoon Shazam! was better the live action one because it was based solely from the comics. also noticed the music from the 1st series was in this one as well. 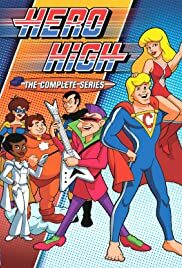 in fact when i see the older show and hear the music, sometimes i think of the animated series. too bad Uncle Dudley and Mentor never met in the show , you know. Cap sounded a bit like He-Man and Mary sounded like She-Ra; i thought they were voiced by the same folks, but they're not. too bad they didn't have them and Isis side by side; that would have been cool. imagine that; Andrea Thomas and the Batsons and Freddy Freeman transforming into Isis and the Marvels at the same time. oh well. it was still a good show; i'm surprised this is not on DVD yet. when in doubt, say the magic words: Shazam! Captain Marvel!